Here's another example of Omarosa's and the Trump administrations tone deafness to the black community. They don't seem to get that the onus is in them to earn the trust and respect of the community through THEIR actions and not the other way around. Refusing to enforce consent decrees, cuts to education and HBCUs, attacks on healthcare (ACA), Jeff Sessions appointment as Attorney General, talking about making stop and frisk the law of the land, not doing anything about discriminatory voter ID laws, and cutting environmental protections don't give the impression that the Trump administration wants to work with African Americans. George Cook AfricanAmericanReports. 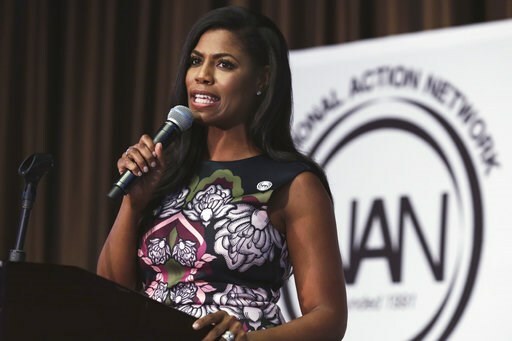 President Donald Trump's liaison to the black community, the former "Apprentice" star Omarosa Manigault, says African-American activists aren't trying hard enough to work with the new administration. The White House aide delivered the pointed message in an interview with The Associated Press in advance of an appearance Thursday at the annual convention of an activist organization founded by the Rev. Al Sharpton. "We're here waiting, willing to work with the community," Manigault said when asked about Trump's moves to slash programs that benefit minorities. "This president wants to engage. It's not a one-way street." She was more measured Thursday afternoon as she faced hundreds of black activists, who, like African-American voters across the nation last fall, overwhelmingly opposed Trump's presidency. Several participants refused to utter the president's name in convention sessions, referring to the 45th president only by the number 45. Trump got just 8 percent of the African-American vote last November, according to exit polls. "I'm ready," Manigault told the crowd as some murmured their disapproval. "I know what I came into, and I ain't never scared." She insisted she's spent her first 100 days in Washington fighting for the black community. She noted that Trump has met personally with the Congressional Black Caucus and the presidents of historically black colleges and universities. Manigault called on black leaders to help the struggling institutions as well. "As I fight for you from the White House, I need you to fight on the outside," she said from the podium of a Manhattan hotel ballroom.